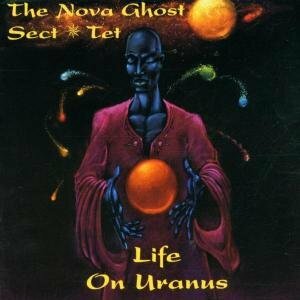 The Nu Nova Compound is a jazz based multimedia performance ensemble based in the Netherlands. The leader, California native and multimedia performance artist Ghasem Batamuntu, performs on soprano saxophone, didgeridoo, misc percussion and self made instruments. Oroviding as well in put thru poetics and projected visual streams. He has resided in Holland for the past 26 years. The ensemble is comprised of musicans and artist from a variety cultures and countries including Senegal, The Americas/USA, Brazil, Cuba, Suriname, Turkey, and the Netherlands. 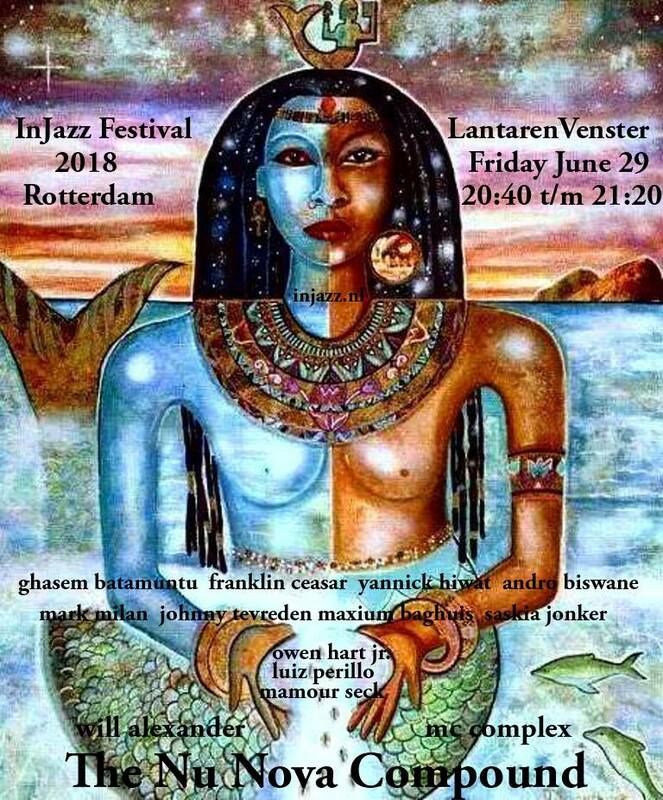 World stage performance credits include: The InJazz Festival 2018 (nl), The North Sea Jazz Festival (nl), The Bimhuis (nl), Lantaren Venster(nl), The North Sea Jazz Festival Around Town (nl), Rotterdam Jazz Festival (nl), Womack Music Festival (sp), The Jerish International Festival of Art and Culture (Amman, Jordan), Jazz Club Minsk Belaruse, Berlin Performance Podiums, San Fancisco Jazz Festival (Ca), Oakland Jazz Festival (ca), The San Jose Jazz Festival(Ca), The World Stage (Ca) and a wide variety of international clubs, theaters, radio broadcast. 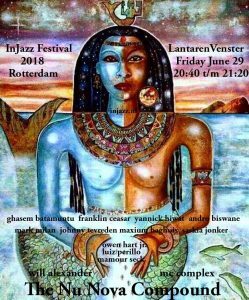 Performances are an eclectic mix of a wide variety of musical genre which feature West African/Brazilan rhythm fusions, along with contemporary and traditional jazz infra structures. Performances can include spoken word, visual arts, even dancers. Recognizable musical influences include Sun Ra, Miles Davis, Gil Evans, John Coltrane. Los Angeles native Ghasem Batamuntu has a long history of musical collaborations and associations which include Jackie Mclean, Julius Hemphill, Sam Rivers, Bobby Hutcherson, Horace Tapscot, Eddie Henderson, Sonship Theus, Tootie Heath, Eddie Moore , Eddie Marshall, Rasul Siddik, David Murray, Omar Sosa, Pharoh Sanders, Archie Shepp, Sonny Simmons, Julian Priester to mention but a few. 9/92-Present: Amsterdam, The Netherlands….Leeuwarden, NL. 2010 Myrth Trimetric Monolith….Fetsih-Fiction Muse, Leeuwarden, Nl. 7/2013 Performance Jazz Club Minsk Minsk, Bl. 9/09 The Puur Jazz Festival w…….Den Haag, Nl. 3/09 Rotown Performance Cafe Rotterdam, Nl. 06/07 Multimedia Presentation…The Nature Museum…Leeuwarden, Nl. Billy Higgin’s World Stage….Nuranus Vortex….Los Angeles, Calif.
Bobby Few Group…..The Bimhuis…Amsterdam, Nl.